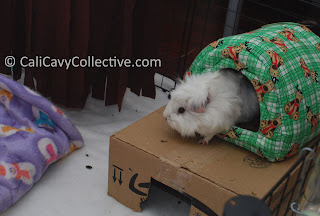 One evening during cage changing, Abby-Roo managed to hop into a fleece hut that had temporarily been stacked on top of a cardboard hideaway. 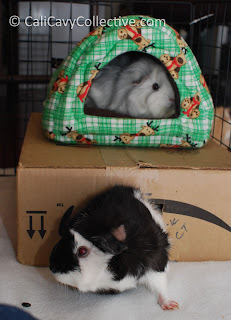 After both cages had been cleaned, she was still camped out inside the hut - so the entire setup was returned to her home, cardboard box and all. She eventually emerged for food but soon returned to her lofty perch. On a more amusing note, Revy hasn't yet figured out the secret behind her roommate's disappearing trick. Of course, Abby-Roo doesn't seem to mind: after all, she now has her own private Revy-free retreat. Since then, Abby-Roo has frequently been spotted bouncing upstairs for a nap. She has been enjoying the makeshift loft so much, it has become a semi-permanent fixture in the cage. If only there was some way for her to smuggle veggies up there then she'd be set! Smug Abby, confused Revy. Good work, little pup. 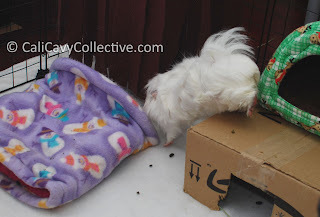 All of those reasons where why Bertie loved her hay rack so much, too! Too cute! Way to go, Abby-roo :) Love the action shot with her little foot sticking out on the jump down, too. 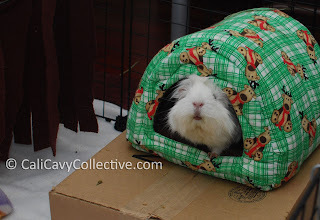 Where can you get a hut like that? I think my piggies Hiccup and Sniffles would love one. :) They're both English Crested, about 3 months. Actually practically look like dopplegangers to Truffle! Hi Erin, I bought the hut from Jens Custom Crafts but it looks like they currently aren't selling them at the moment :( sorry! Hopefully you can find something for little Hiccup and Sniffles to enjoy!